Most English words are made up of smaller elements: roots, prefixes and suffixes. When you know the common ones and how to combine them, you can understand hundreds of different words. The majority of academic vocabulary uses Latin roots and affixes. (Affixes are prefixes and suffixes.) They are especially useful for English university study or professional work. If you already speak a Latin-based language like French, Spanish, Italian, or Portuguese, you have a huge advantage in reading academic English. If not, you can still increase your vocabulary faster by studying roots and affixes. Studying the roots on the following pages can still help you see common patterns and recognize new words. It’s easier to learn words in groups. Studying related words together helps you see the connections between them. That's why I include so much information on the words made from each root. There are also examples of the ways English words can change form (and part of speech) for use in different places of a sentence. The sections below on roots, prefixes and suffixes link to pages with more detail and practice. Greek & Latin Root Words Table, a list or index of all the roots covered on these pages, with their meanings, examples, and the pages each is practiced on. 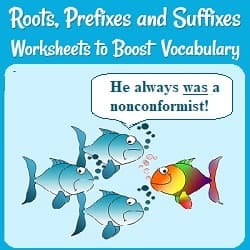 For inexpensive pdf worksheets that can quickly increase your vocabulary by studying roots, prefixes, and suffixes go to Root, Prefix, and Suffix Worksheets. If you want to practice words from a particular root, use the root words table above to find the page or pages with more information on it. English Words from the Latin Root Ponere. As you read new words, analyze them. Are parts familiar? Can you see a pattern? For example, if you read about a retractable blade, maybe you can make some good guesses about its meaning before you look it up. For retractable, you may know that the prefix ‘re’ means 'again' or 'back', and ‘able’ means that something is possible. So retractable probably is about the possibility of ‘tracting’ something back, or again. ‘Tract’ is also the base of ‘attract,’ ‘distract,’ and ‘traction,’ so it seems related to a pulling movement. In fact, retractable wheels on an airplane can be pulled back into the body of the plane. Retractable hose can be easily re-wound, and retractable awnings can be opened out or pulled back easily. You can learn more prefixes like ‘re-‘ on the alphabetical List of Prefixes (with examples of each) and Common Greek and Latin Prefixes. (It's a table of the same prefixes arranged by English meaning, so you can compare the Latin and Greek forms). You can practice prefixes of location and relationship (anti-, com-, ex-, in-, sub-, sym-, and trans- plus) on 7+ Common Prefixes that Dominate Academic Vocabulary, or study and practice the Prefix 'Re-'. There’s more information about the different ways to make words negative on the Negative Prefix List. It gives examples of each prefix and explains the differences in their meanings and use. Check your understanding on the Practice Negative Prefixes page. Suffixes not only can change the meanings of words, but they often change their positions in a sentence. It’s very helpful to know the different endings that belong to different parts of speech. Adding an ending can change one part of speech into another. For example, adding ‘-ive’ to ‘act’ (a noun or verb) makes the adjective ‘active.’ If you add’ -ly’ to ‘active’ you get the adverb ‘actively.’ You could add ‘-ate’ instead to get the verb ‘activate.’ Each means something different and fills a different place in a sentence. The more you recognize the different endings, the more easily you can understand what you read, or use the words correctly when you write. The List of Suffixes gives an alphabetical listing of the most common word endings. Suffix List Arranged by Use gives the same suffixes grouped by their purpose. (It lists suffixes to form nouns, verbs, adjectives or adverbs. It also discusses suffixes for plurals, different verb tenses, or comparatives.) It gives more examples and explains suffix use for the different parts of speech, tenses, etc. Practice Suffixes gives the meanings of some common word family members (agree, agreeable, agreement; maximum, maximal, maximize; etc.) Then it asks multiple-choice questions about which form would be best to use in different sentences or situations. There’s more information in Word Families, and practice, especially with suffixes, on Word Family Practice and Word Formation Examples and Exercises. Would you like a simpler, more organized way to learn the essentials for using roots and affixes? The most efficient way to learn common roots and affixes is with a step by step course. This inexpensive course will teach you the most common prefixes, suffixes, and roots, and will give you the background you need to continue learning them as you keep reading in English. Whether you take a course or study a few at a time, learning common roots, prefixes and suffixes is worth the effort. Knowing how they combine can help you recognize hundreds of new English words! Knowing a few roots & prefixes can help you figure out the meanings of new words. If you know ‘form’ (shape) and ‘con’ (with), you can guess that ‘conformity’ is about trying to be like others. Other words from Latin verbs of motion: attract (pull towards), & retract (pull back) from the Latin root meaning 'pull;' compel, expel, propel, repulsive from the root for 'drive' and'driven'-- and many more, along with a matching quiz for practice. This suffix list, arranged by use (parts of speech, etc.) shows the way changing the suffix changes the way a word can be used in a sentence.